Perhaps you’ve seen this map that has been floating around social media lately. It was created soon after the 2016 election by Reddit user Taillesskangaru and is posted here. Let’s pretend that Did Not Vote were a candidate in the 2016 election. 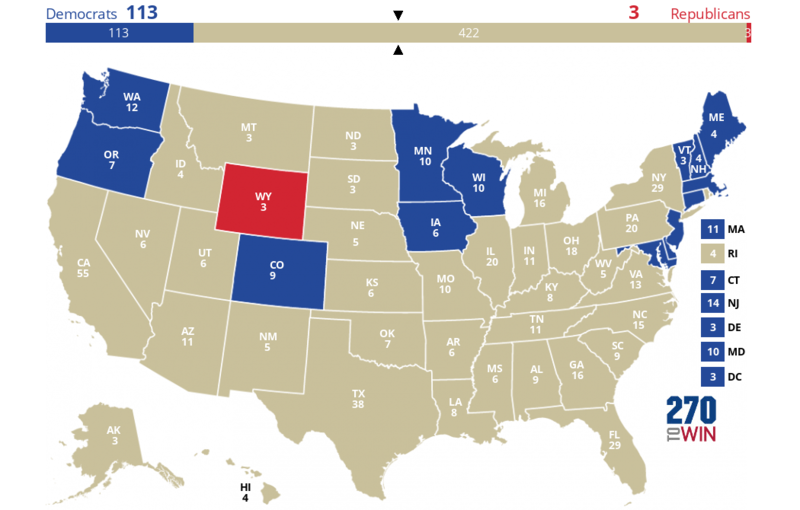 The number of eligible voters who did not vote exceeded the vote totals garnered by any living candidate in 42 states. 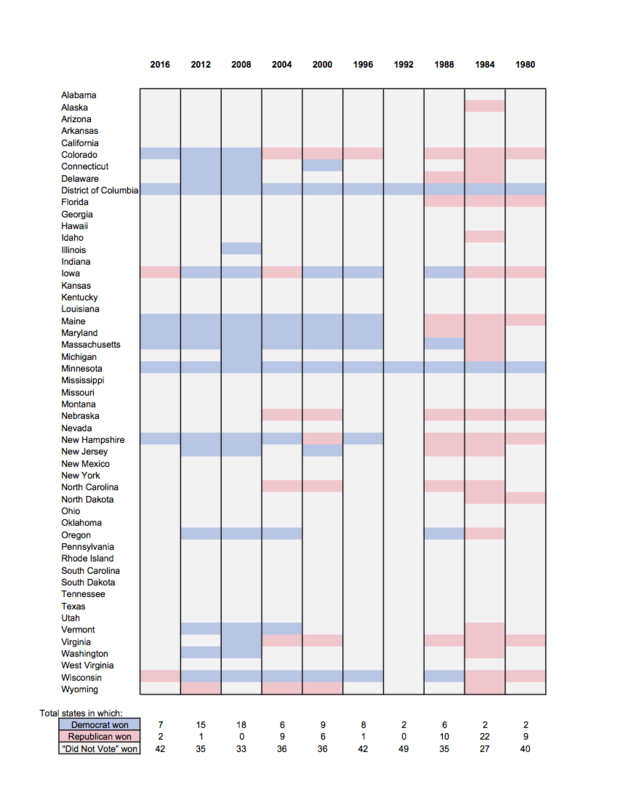 The dominance of Did Not Vote mostly reflects the relatively low voter turnout, even in presidential election years, in most states. 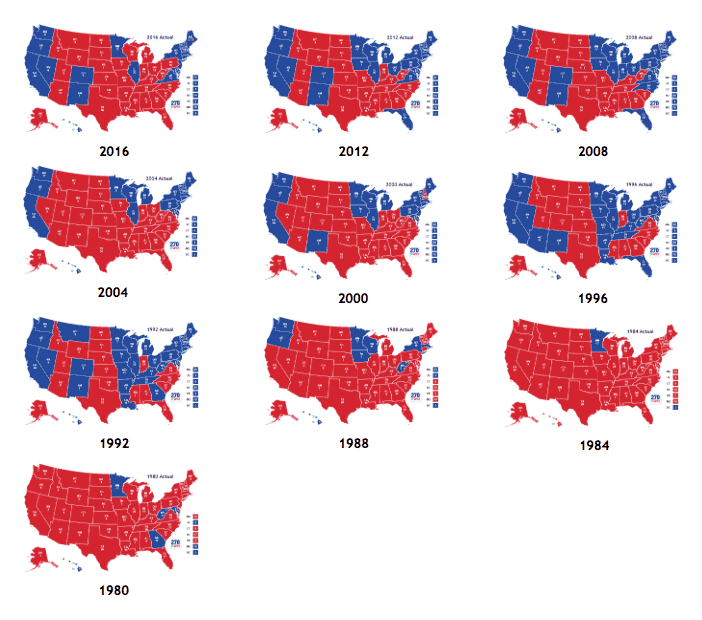 Nationwide, turnout has varied in a range from 50% to just over 60% for the last 40 years. In 2016 it was 59.3%. In some states, in some presidential elections, turnout has been below 40%. 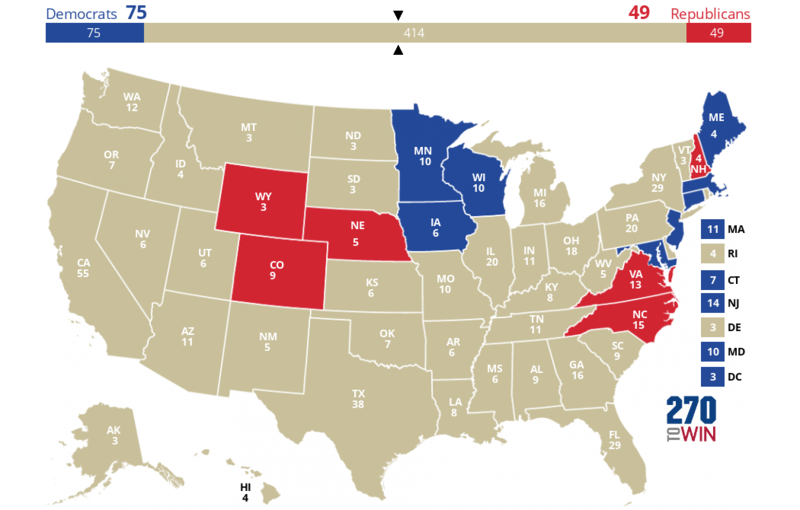 If Did Not Vote were a candidate, it would have won, handily, every one of the last 10 presidential elections. Full details follow. At no time in the last 40 years has the elected president won even a plurality, let alone a majority, of the votes of the eligible population. Did Not Vote has always come first, the nominal winner second, and the loser third. 2016 was not anomalous in the context of the 10 previous elections: that year was tied for second place in the number of states in which Did Not Vote swept the field. 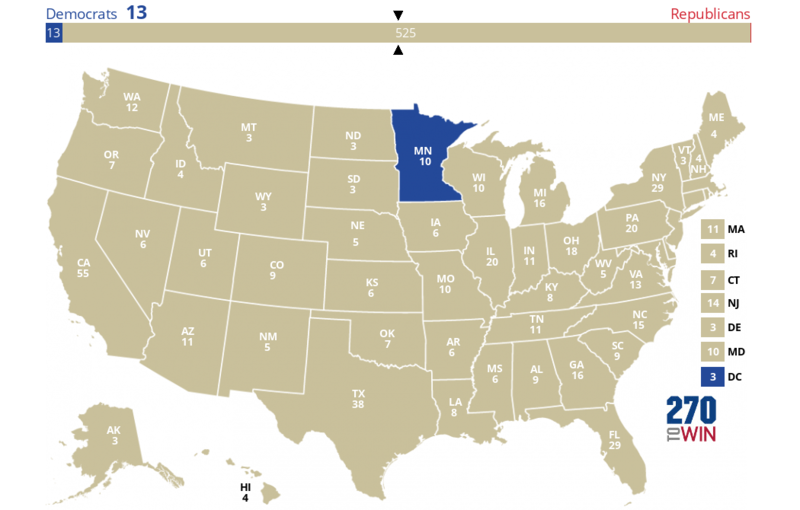 In only two states — Minnesota and Washington DC — did one of the flesh-and-blood candidates beat Did Not Vote in every presidential election going back to 1980. In Minnesota’s case this was due to its relatively high turnout: the state has led the parade with turnout ranging from 66% to 78% over the last 10 elections. In the case of DC, the loss of Did Not Vote is down to the lopsided (overwhelmingly Democratic) pattern of voting. 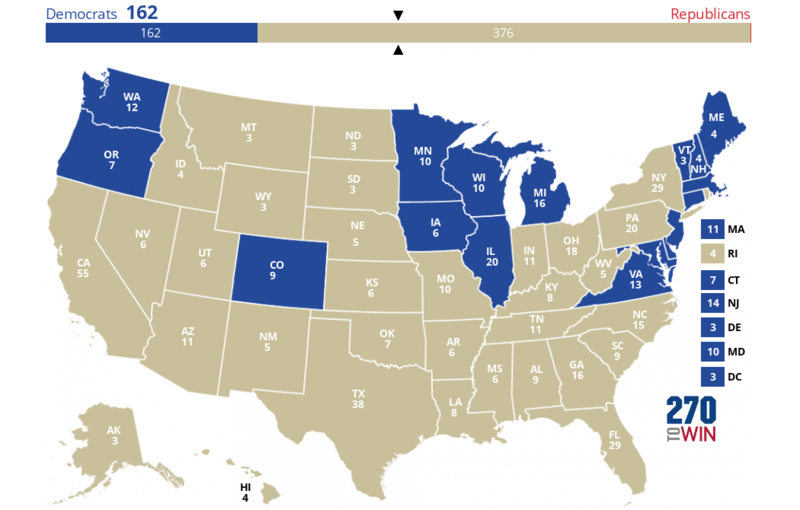 Did Not Vote won in only a single election year (1992) in five states in the second tier of voter turnout. These states are Colorado, Iowa, Maine, New Hampshire, and Wisconsin. 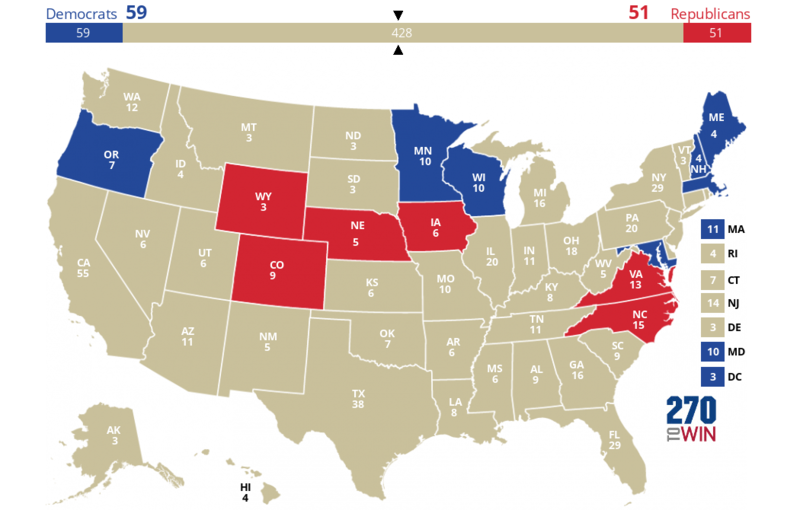 An amazing and discouraging total of 26 states saw Did Not Vote win in every one of the last 10 presidential elections. 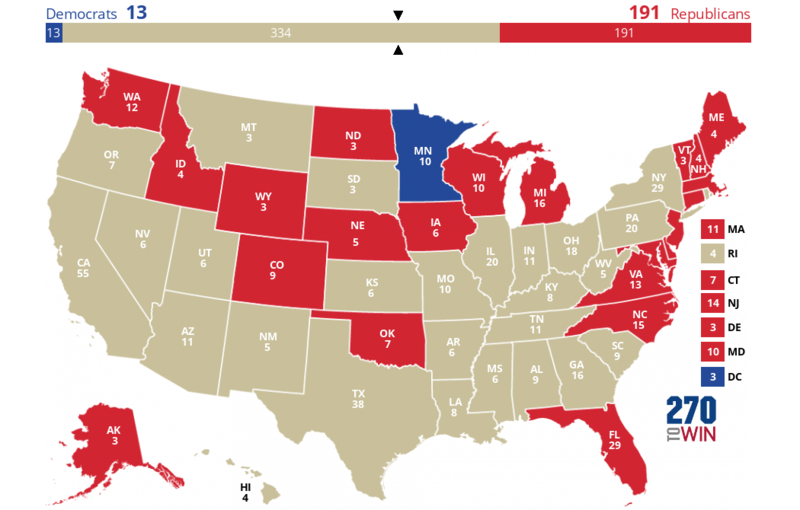 In the year in which Did Not Vote won the fewest states, 1984, it still swept the electoral college with 334 electoral votes — a wider margin of electoral victory than that of Donald Trump in 2016. 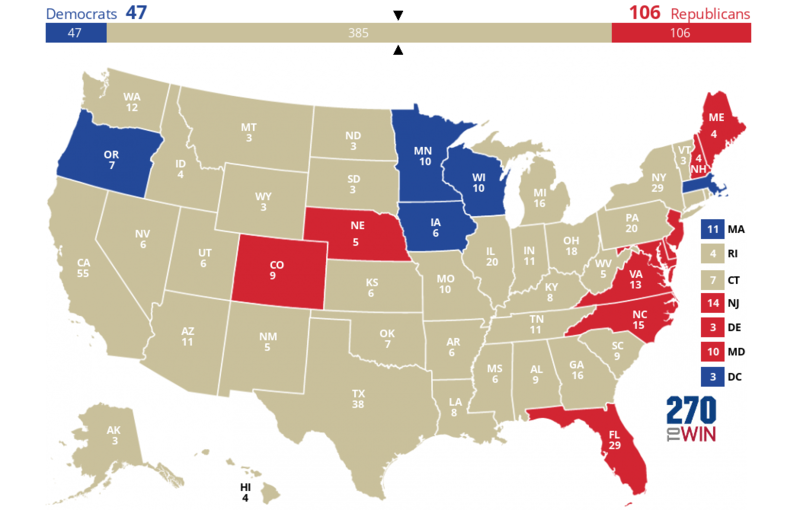 The following two images show the state-by-state pattern of Republican and Democratic voting in the last 10 elections, and the lopsided victory of “candidate” Did Not Vote in each of those elections. 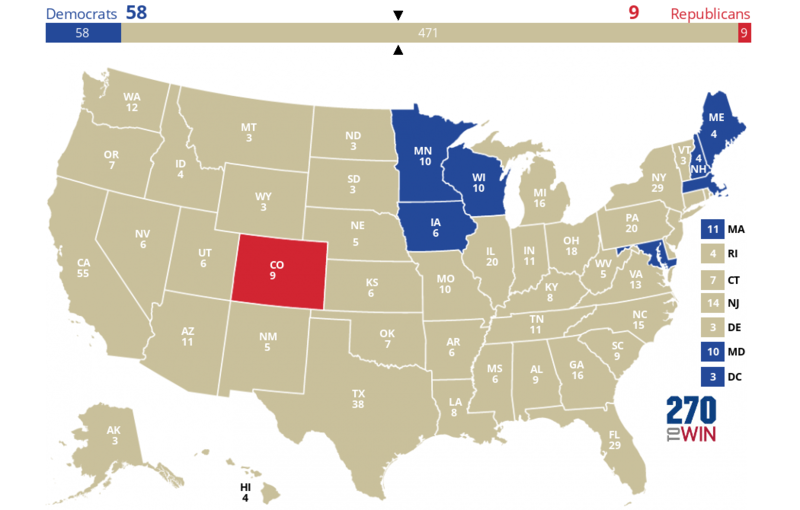 Here are full-sized map images of the electoral triumph of Did Not Vote. 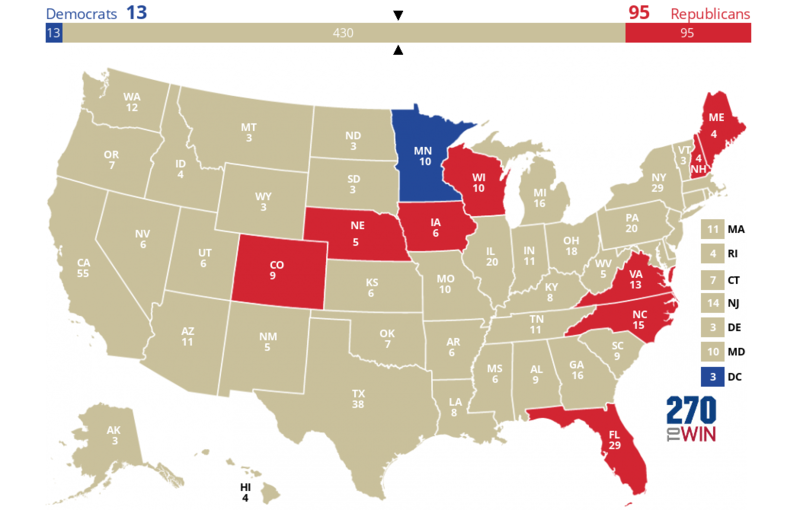 Data sources: state-by-state on election results, voter participation. 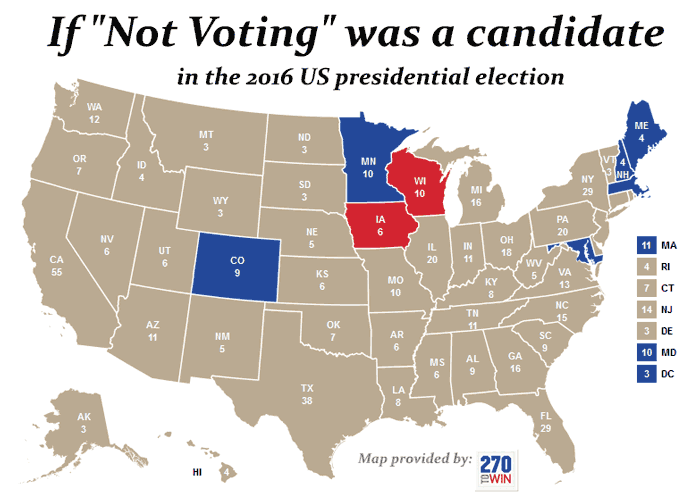 The Did Not Vote maps were made with the aid of the elegant tool at 270towin.com. – Don’t bother me with politics. – It’s just a lot of BS. – The fix is already in. – My vote doesn’t matter. – I don’t think any candidate will matter. – My preferred candidate was not on the ballot.